When was the last time you heard someone say, "Man, that was a great motorcycle ride! Two hundred miles and not a single curve. Flat and straight the whole way." Probably never, right? Negotiating curves is a big part of what makes the experience of one-track vehicles so fundamentally different from two-track vehicles. It gives us the chance to feel like we are working in harmony with the machine instead of being tossed to the side of a box. Cover of "Cornering Confidence" by Jon DelVecchio. Of course that's only true if we negotiate those curves confidently and skillfully. Otherwise, curves can be a source of anxiety. And the government's traffic statistics show that when a motorcycle crashes with no other vehicle involved, it's usually in a curve. That's why it makes sense that riding instructor Jon DelVecchio decided to focus his book strictly on cornering. "Cornering Confidence: The Formula for 100% Control in Curves" is all curves and nothing but curves. There are more opportunities than ever before for riders to enhance their skills beyond the beginning level, from books to track-based schools to street-based schools and even the occasional bit of advice here at Common Tread. Yet most riders seek out no formal training. In this book, DelVecchio, the owner of the Street Skills rider training school, takes you through several skills you need, from smoothness with the throttle and brakes to where to focus your vision. The end goal of these exercises is to lead you to what DelVecchio considers the two crucial skills for corning: body position and trail braking. On the street or on the track, shifting your upper body and "kissing the mirror" lets you get through the corner with less lean angle -- or with the same lean angle but more speed. Photo by etechphoto.com. DelVecchio sets up his lessons by explaining how the goal is to keep the bike "straight and flat." By straight he means minimizing the amount of lean needed to get through the corner at a given speed. By flat he means having the motorcycle neither pitched forward nor backwards. A motorcycle that's leaned less and doesn't have an excess percentage of weight on either wheel is one that has the most traction available for negotiating the turn. Body position is how you limit the amount of lean needed. More than just looking where you want to go, he advocates pointing your nose toward your target, not just moving your eyes. He uses "kiss the mirror" as the image for getting your upper body weight forward and to the inside of the curve. Many riders put an undue emphasis on getting a knee down, but DelVecchio focuses on positioning your upper body. He treats shifting your lower body weight as secondary and optional. The best example I can think of to support that view is this: I know of two riders who are paralyzed below the waist and do amateur racing and track days. Obviously, they can only shift their upper bodies. Yet both have had some amateur racing success and can ride faster than I can on the track. Clearly, dragging a knee is not essential for going fast. Also, while racing is not the same as street riding, I think it's interesting how riding styles at the top level of roadracing have evolved over the last two decades to emphasize upper body position, as shown in this composite photo that's been making the rounds on social media. Clearly, there are other factors involved, including huge changes in the race bikes, but the difference between Marc Márquez and Mick Doohan, two racers who dominated on Hondas two decades apart, is still striking. Using proper body position gives you added control in the corners. What you do with that added control is up to you. You can take the corner at the same speed and have a bigger margin of safety, or you can keep the same margin of safety and go faster. Either way, you're better off. The advisability of trail braking on the street is the subject of some disagreement. I'm a proponent. 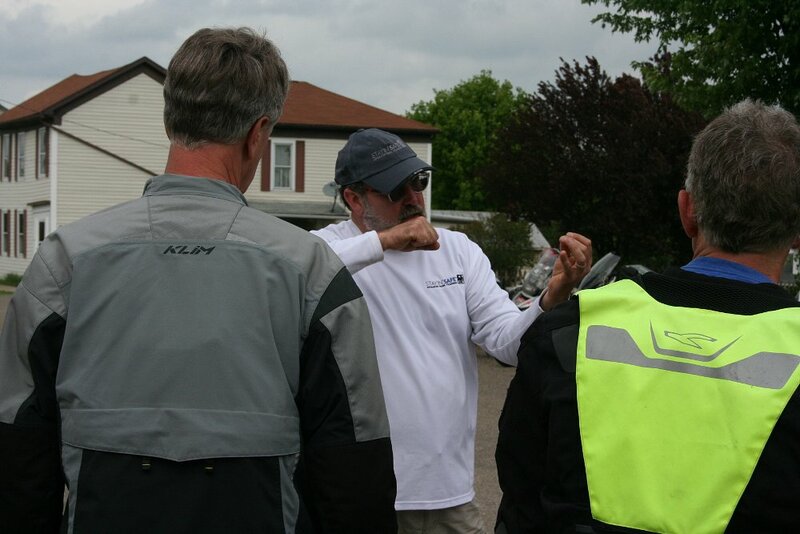 It's a key component of schools such as the Yamaha Champions Riding School. And DelVecchio is definitely all for it. Trail braking — continuing to use braking force after initiating the turn — helps keep the bike flat, to use the term from the book. Back when motorcycles didn't handle as well and tires had less grip, the thinking was that you had to finish braking before turning. However, releasing the brakes entirely at the time you're initiating a turn can cause the bike to get unsettled, as the compressed fork rebounds and takes weight off the front tire. While trail braking is essential in racing, some question the value on the street. DelVecchio argues (and I'd agree) that by continuing to apply a little braking force through the turn, you give yourself more options for dealing with the unexpected on the street. You can vary your braking force as needed without upsetting the chassis (making the bike not "flat"). On the other hand, if you're completely off the brakes and then find mid-corner that you need to slow, getting on the brakes at that point can unsettle the motorcycle and leave you with less traction, just when you need it most. A student at the author's Street Skills riding course practices the skill of not just looking where you want to go, but pointing your nose at your target, as DelVecchio teaches. Photo by Bryan Finch/572Creations. If taking a beginner Motorcycle Safety Foundation course is Motorcycle Riding 101, then "Cornering Confidence" is maybe one module of Motorcycle Riding 201. There's a lot to know about street riding that's not covered here. For example, the book's diagrams tend to show a classic racing line through the curves, with the rider near the center line entering the turn, clipping the apex halfway through and ending up near the center line again on the exit. This is different from the late apex approach that gives you a bigger safety margin on the street by letting you see further through the turn before initiating your lean and keeps you from being pointed toward that center line, where an oncoming car might be encroaching on your space. Of course I'm sure DelVecchio would point out, correctly, as he does in the book, that one point of his advice is to give you additional control so you have the ability to make midcorner adjustments, whether due to that oncoming car or unexpected gravel or wildlife or whatever. The fact that "Cornering Confidence" is not a comprehensive guide to street riding techniques is not a criticism. It's more a call to the reader to keep on learning even after you get to the end of the book. DelVecchio's book is not the end of your education. But considering that the corners are where you're most likely to get into trouble — and where you're most likely to have fun — it's a good place to start.